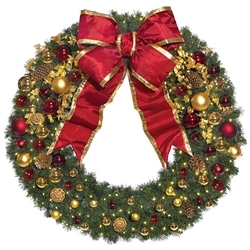 Traditional Wreath comes decorated in Burgundy and Gold ornaments, Gold Ivy, Golden pine cones and a burgundy Bow with gold trim. Sold (1) per box. Lit with LED warm White and Red mini lights. 3' with 100 LED Lights - weighs 15 lbs. 4' with 150 LED lights - weighs 25 lbs. 6' with 250 LED lights - weighs 85 lbs. 12' with 1,800 LED lights - weighs 290 lbs. Call for shipping rates on 4' and above.